Birding Is Fun! : Birding is still fun! Over the last month I have been nearly absent from the online birding world, including from my own blog here. Thank goodness there have been awesome contributors here to keep things alive. BiF Contributors are wonderful and talented people! (Thank you.) I've been pretty sick and I finally started getting better after a couple of weeks of misery when I finally sought medical assistance and high-powered drugs. Being sick seemed to have killed off my birding spirit. I had no motivation to do anything bird related at all...actually I didn't have motivation to do much of anything at all. Exuberant emails swept across my iPhone about the wide variety of shorebirds being seen along the Antelope Island Causeway and I didn't care. I've never been ill this long before, so it was a rather strange and depressing experience for me. 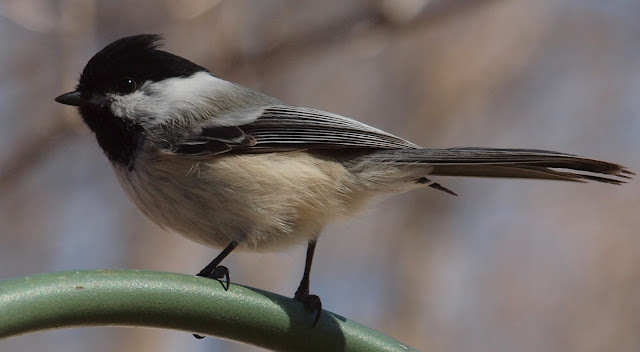 Anyway, during my malaise, I did have some days that were better than others and I didn't completely neglect my lunch-hour birding patch and my backyard feeders. The Robin's aubade was certainly noticed and profoundly uplifting to my soul. Finally, I'm nearly all well. Just a little temporary deafness in my right ear annoying me still. My normal birding spirit and vigor is being renewed. I am very excited for the return of Lazuli Buntings and Western Tanagers to my backyard feeders. I have a big goal of getting some nice Lazuli Bunting close-ups, so my makeshift photography blind is about to make a come-back. Next week I will also be heading to North Carolina's Crystal Coast for a familiarization tour. The itinerary looks really cool with lots of opportunity for birding, sight-seeing, and learning about the rich history of the area. I've already used eBird to discover that there about 40 potential life birds awaiting me there. If I see 15 of those I will be ecstatic. Thanks to Ted Floyd, editor of the ABA's Birding magazine, for thinking of me for this opportunity. Look forward to a series of posts about the Crystal Coast in May here at BirdingIsFun.com. In other personal news, it's looking like the Mortensen family will be moving back north to the Boise, Idaho area this summer. I have the opportunity to join my father in the family home building business and possibly do some contract/consulting work for a couple of my past employers. The economy for home builders is still about as bad as it can get. We plan to focus effort on remodels and additions so that the baby-boomer population can enjoy some nice upgrades in their homes. I'm scared to death and very excited for the future. Those darn Spotted Towhee's still are not giving me those clutter free shots. Maybe this Spring as they perch atop the brush and sing I'll have an opportunity. Sorry to hear that you have been ill Robert and glad to hear that you are starting to feel better. Glad you are getting better Robert and wish you well in the upcoming move. Great shots. I just saw my foy Eastern Towhee, also non-clutter free. Awesome shots, Robert.. be well and happy. Good to have you back Robert. I'm looking forward to your Lazuli Bunting shots too, and for that matter your findings in Carolina, an area where I've been wanting to bird for a while now. Good to have you back Robert and to hear you are on the road to full recovery. Hope the move and employment plans work out well ... can't be easy in these difficult trading times. Super series of images as usual. P.S. Did you get the e-mail I sent on 3 April? Love these birds. Wonderful shots!! Great photos Robert! Glad to hear you feeling better!! So sorry to hear you were feeling under the weather. I hope you have recovered fully now. Beautiful bird captures! Happy birding in North Carolina!